Former USA Sevens player Dallen Stanford gives us his thoughts as the HSBC World Rugby Sevens Series heads to Las Vegas and Vancouver where he will be commentating. By Dallen Stanford – former USA Sevens player and World Rugby Sevens commentator. The 2015-16 HSBC World Rugby Sevens Series has been absolutely EPIC! One always expected the level of competition to be raised leading up to the Olympics, especially with several 15s superstars entering the mix. But what has impressed me this season is that six different teams have contested a Cup final – and surprise results like USA defeating New Zealand haven’t been isolated incidents. Events like the Olympics bring pressure – and in the game of sevens one small mistake leads to unexpected results –like when Wales won the 2009 Rugby World Cup Sevens in Dubai. In that tournament all four favourites were knocked out in the Cup quarter-finals – and for me that’s what makes the sport such an exciting sport. We have seen that time and time again this season, and it's a pleasure to be a part of. As the series heads to North America, with tournaments in Las Vegas and Vancouver, it's great to see the rise of the sport, especially in the USA. Rugby is fairly established in many nations, but the tipping point for the sport in the United States will be the Olympic Games, especially if both Mike Friday and Jules McCoy’s teams can produce consistent performances and secure a place on the podium. 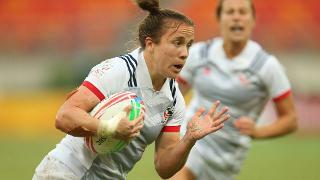 It’s an extremely exciting time for rugby in America – keeping us busier than the Honey Badger at a hair salon! The newly-formed Americas Rugby Championship (ARC) has been a superb success, creating more high-level fixtures for the 15s squad, plus exposure for new players and an opportunity for fans to watch international rugby live or on television or online. Later this year another sell-out is expected for both the All Blacks versus Ireland (61,500 at Soldier Field) and USA versus the Maori All Blacks (30,000 at Toyota Park) in Chicago. Plus Pro Rugby begins in April, providing a chance for 120 paid professional rugby players, the first of its kind outside of the USA Sevens squads. With an eye on the next round, I'm intrigued to see the outcomes. Only three teams have adapted to the narrower field in Las Vegas and the adjusted three-day schedule to be crowned champions. South Africa in 2011, 13 and 14, Samoa in 2010 and 12 and Fiji last year. Playing at home is always very special, and the familiar surroundings with family and friends nearby usually mean an elevated performance. It would be fantastic for the USA to reach the Cup finals and repeat what they did at Twickenham last year! With them paired with Canada in the pool stages too, that's some spectacle waiting to happen! I have attended the USA Sevens for the past 12 years – seeing the event at the Home Depot Center in Carson, playing at Petco Park in San Diego, and watching the fans pour into Las Vegas since 2010. United World Sports has done a brilliant job in expanding the event –which now includes one of the largest youth and club rugby events in the world – with over 275 teams and 5,000 players at various locations outside Sam Boyd Stadium. I also love the fact that World Rugby have chosen so many new and exciting venues for the current series! The Cape Town Sevens was amazing, and rates as one of my favourite outings outside of Hong Kong and Wellington. Vancouver is a stunning venue, and just reward for Rugby Canada, who have really excelled with limited resources in both 15s and sevens. I remember being in the stands cheering for Canada as they defeated Samoa in a Las Vegas thriller to take third place in 2014. It’s time for rugby to be showcased yet again in North America – and I’m hoping for an inspired performance from the hosts!